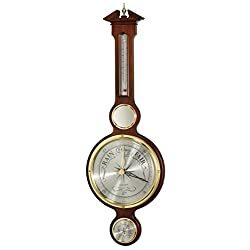 What is the best weather maritime olympia wall clock? The design of this wall clock is very European one could easily imagine it on the outside of a store front on a cobblestone lined street. The clock comes with a scroll like wall mount hook to hang the clock from adding to the character and charm.